Old wooden fences still partition the West. Reminders of another era, they stand solidly beside highways in cattle country or gently tilt back to earth along forgotten trails. Their very names, snake fence, Russell rail fence, leaning rail fence, bring to mind a time when a skilled fence builder was a very desirable ranch hand . In those days frugality was as important as skill. 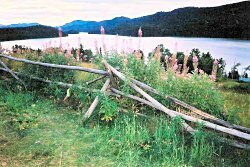 Miles of wooden fence were built using materials at hand, often without nails or wire. Building these fences wasn't just a matter of sinking in some posts, attaching wire and moving the tractor or 4-wheeler along. Why, some of them didn't even have posts. "Snake fence in B.C. 's Cariboo country." 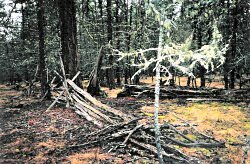 The snake fence, for example, began with bottom logs, placed on the ground. Notches, or saddles, were cut in these logs and the building logs placed carefully in them. No posts or nails were needed. The weight of the logs and the zig-zag style of construction held these handsome fences in place. It was heavy work a definite two man job. A snake fence might be as low as 3 feet or as high as 6, but the average was 4-5 feet high. Logs used varied from 8" to 16" in diameter and were debarked before use to make the fence last longer. Logs for building were cut from both sides of the right of way so the material didn't have to be hauled a great distance and the land was cleared as the fence builders moved along. The snake fence had many advantages; it was sturdy, used readily available trees, needed no hardware, and required a minimum of skill. It was the best fence of all for country inhabited by game, in fact government used to require that only snake fences be used in important wildlife areas since they would stop cattle from wandering but game could usually find a way over them. Like the snake fence the Russell rail fence was built of handy trees. In the Cariboo country of B.C. the jackpine, a hardy pioneer species, usually of small dimensions, was the perfect size . The fences could be up to 7 feet high, but the average height was 6 feet. Built properly, the Russell rail fence was a work of art, all symmetrical and the same height. It was a fence adapted to any landscape. There were no holes to dig nor posts to rot. It could easily wind around corners, march over hills or meander down in hollows. The Russell rail fence used tripods for fence posts. The top rail was set on top of the tripod and the rest of the rails hung by wire from the top rail. One leg of the tripod, the 'tie piece', was staked into the ground. The other legs, all above ground, were wired or nailed to the stake. This stake kept the rail fence from collapsing off into the distance like a string of dominoes. The leaning rail fence is similar to the Russell, except that all the rails are placed on the tripod, not hung from the top rail. These wooden fences lasted for decades, primarily because there was very little in the ground to rot. If the bottom of a tripod rotted, the fence just gradually got lower. If the bottom log on a snake fence, the one touching the ground, rotted, it would be replaced. "Bob Hawkings stringing barbed wire, Wolf Ranch, Pritchard, B.C." convenient trees. But, a post and wire fence with posts sunk in the ground had as many rot problems and took just about as much maintenance as any wooden fence. Once treated fence posts were available, the barbed wire fence became economical. Wood or wire, though, fences are the curse of a rancher's life. 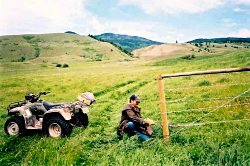 On any big ranch there was, or ought to have been, a steady fencing crew monitoring fence lines and replacing posts. In busy times or slow,there's always fencing to be done. That's the theory, anyhow. It didn't always happen. Any urgent problem with the fence being down always happened at the wrong time. A hasty call to round up strays usually came right in the middle of haying. Once the cattle were collected and the fence patched up, the rancher would vow to repair it as soon as possible. But, then there'd be an early snow and a hard winter. Pretty soon, right in the midst of calving and branding someone would yell "Part of the fence is down and the steers are out!" "Good fences," wrote New Hampshire poet Robert Frost, "make good neighbours." Frost didn't mention gates. Probably because, where he lived, a gate was a sturdy, low, well-balanced item easily opened by even a small child fetching the family's milk cow. If he'd ever struggled with the average ranch gate, Frost might have given it a stanza to itself. Not the formal, 'Welcome to the Ranch' main gate which is usually pretty handsome. The gates to contend with are the ones out on the range. Maybe it's a test of muscle and determination, a way of weeding out the weak and infirm. Whatever the reason, shutting a gate usually means picking up a quarter mile of fence along with it. Shutting a slip wire gate is best done in stages. First, the easy part, you hug the fence post to get leverage and carefully place the bottom of the gate in the wire loop. To get the top of the gate in its loop you hang on to the fence with your arm around the post and barb wire digging into your shoulder, pull on the gate and all that wire and, quickly, before you're permanently maimed, snub the top part into the loop. Sometimes this works. Or, you can spend a frustrating twenty minutes trying to tighten the fence and wire enough to secure the top. Good fences may make good neighbours, but good gates make happy employees and ranch visitors. So, why not a sturdy, latched gate? It probably is a test. The old wooden fences may be slowly vanishing, but the physically challenging West is still here.